Genesis 6:13 (KJV) And God said unto Noah, The end of all flesh is come before me; for the earth is filled with violence through them; and, behold, I will destroy them with the earth. 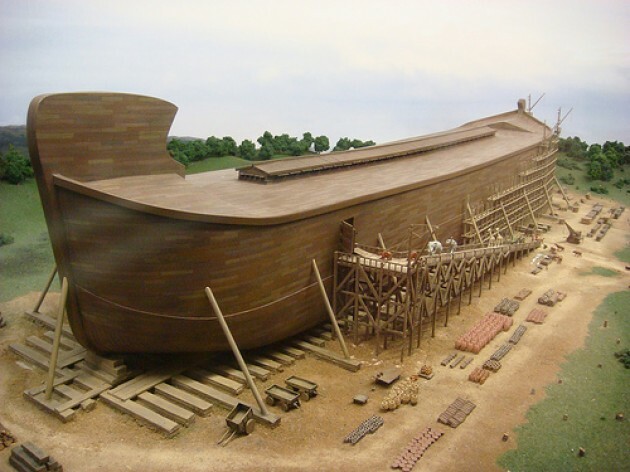 Genesis 6:14 (KJV) Make thee an ark of gopher wood; rooms shalt thou make in the ark, and shalt pitch it within and without with pitch. Genesis 6:15 (KJV) And this is the fashion which thou shalt make it of: The length of the ark shall be three hundred cubits, the breadth of it fifty cubits, and the height of it thirty cubits. That gives a volume of 1,518,750 cubic feet. Genesis 6:16 (KJV) A window shalt thou make to the ark, and in a cubit shalt thou finish it above; and the door of the ark shalt thou set in the side thereof; with lower, second, and third stories shalt thou make it. Genesis 6:17 (KJV) And, behold, I, even I, do bring a flood of waters upon the earth, to destroy all flesh, wherein is the breath of life, from under heaven; and every thing that is in the earth shall die. The average size of an animal is that of a sheep so only about 36% of the ark was used for animals if the figure of 50,000 is used. However, it was probably more like 16,000 animals that were present on the ark. That would only be 12% of the ark used for animals. If the ark was totally full then it would hold 138,888 animals.